As the chocolate nibs kept spilling over the sides of my mortar while I smashed them into a paste with my pestle, I realized that making chocolate was the last thing I ever expected to do during a visit to London. But as it turned out, the class, which my mom and I attended at Hotel Chocolat during a girls’ weekend getaway, was just one of the pleasant surprises that the Seven Dials and Covent Garden had in store for us. 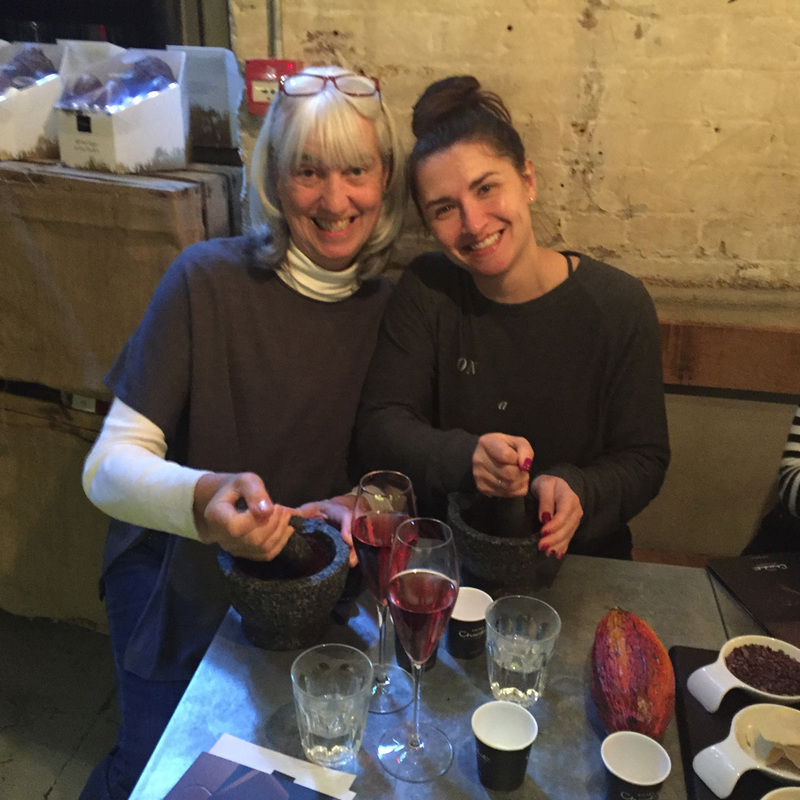 The author (right) and her mother, Kathy, make candy at Hotel Chocolat. Whether you’re planning a motherdaughter escape, a romantic weekend, or a getaway with your best gal pals, here’s how to spend a long weekend in these West End spots. Upon arriving at Heathrow Airport, we hopped an express train to London’s Paddington Station. One quick cab ride later and we arrived at our hotel, Covent Garden’s One Aldwych. With our room not yet ready, we took advantage of the extra down time and wandered over to the Portrait Restaurant and Bar atop the National Portrait Gallery, where we enjoyed a light lunch and a few glasses of wine while overlooking the city skyline. Back at the hotel after lunch, we settled in for a much-needed nap before heading to dinner at Eneko, the hotel’s gourmet, Basque-inspired restaurant. We feasted on chilled crab, oysters and monkfish before surrendering to our jet lag for the night. There’s nothing like strolling downstairs to the hotel’s restaurant and enjoying a leisurely, full English breakfast of eggs and assorted meats to kick off the day. Fully fueled, we set out for a bit of shopping in the Seven Dials area, the network of seven streets that link Covent Garden to Soho. Come lunch time, we made our way to Compagnie des Vins Surnaturels, where we enjoyed a few glasses of wine and shared plates of white asparagus and crab toast. In a satiated haze, we headed back to One Aldwych for 60-minute Well Being massages at its spa, delighting as stress melted away from our muscles. That evening, feeling refreshed, we strolled through Seven Dials to Pizza Express Jazz Club in Soho, where we lapped up live music and munched on hot, gooey pies. I started my day with a solo, 75-minute yoga class at Seven Dials fitness spot Another_Space, then met Mom for lunch at Native in Neal’s Yard, where we enjoyed venison and boar ragu. After visiting a few cosmetics shops such as Fresh (a global store known for its face masks), we headed to Hotel Chocolat for our Bean to Bar Experience, during which we made our own candy. As our weekend wound down, we made our way to Vico, on the fringes of Seven Dials in Cambridge Circle, for one last evening meal. There, we dined on small plates of fried lasagna and artichoke tortelli. Reluctant to wrap up our visit, we opted for a nightcap in One Aldwych’s Lobby Bar before heading to our room to pack for our Sunday flight. As I sipped my Bordeaux, I reflected on the visit to these parts of the city that were now familiar to me. From the delicious meals to the yoga and chocolate-making classes, the trip was filled with experiences that made every hour of the plane ride to London and back worth it. I was left loving London—and ready to return ASAP. For more information, head to visitlondon.com.